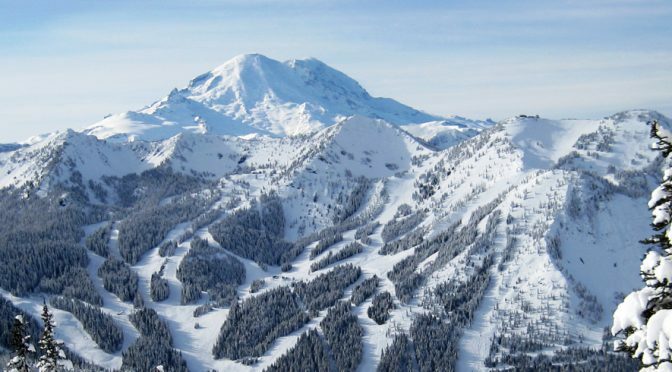 Crystal Mountain, WA – Crystal Mountain officials sent a strong message this week to those who would duck a rope to ski closed slopes. The incident occurred at around 11 a.m. on Tuesday when two skiers — males ages 23 and 30, one of whom was an employee of the mountain — entered the closed Southback as ski patrol was conducting avalanche control work. This, however, was a fairly egregious violation. The pair apparently entered the Southback just after patrollers had lit the fuse on two separate explosive hand charges. One detonated approximately 100 yards above the skiers and caused a small slide, while the second charge detonated adjacent to the skiers and provoked a rather large avalanche. Although one skier attempted to flee from patrollers, both were apprehended and turned over to authorities. Each man faces a fine of up to $1,000, and the one who was an employee has found his employment terminated. This week’s incident wasn’t the first close call between Crystal skiers and large firecrackers. In December 2012, a wayward skier ducked a control rope leading to the Employee Housing slide path just as patroller Christina von Mertens tossed a lit 25-lb. charge from a hovering helicopter. That skier escaped without being apprehended, and barely escaped with his life.